Any-side-up diagrams for representing scientific disciplines were introduced by Herbert Walter in his textbook, Genetics, in 1928. Walter's diagram has been adapted here for the discipline of molecular evolution. Any-side-up diagrams capture multiple perspectives on a discipline while not privledging any single perspective by virtue of the orientation of the text. 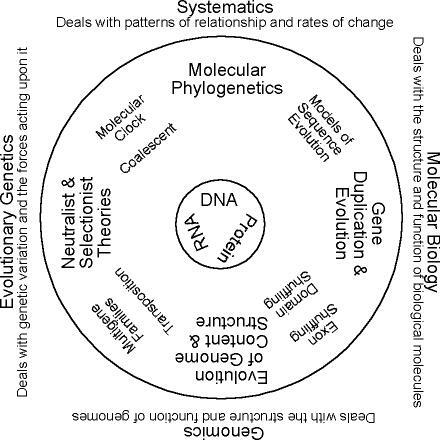 The concentric circles of the diagram for molecular evolution are framed by the four major perspectives informing the study of molecular evolution: systematics, evolutionary genetics, molecular biology, and genomics. Text in the outer layer of the concentric circles represent important subjects of inquiry within molecular evolution. They are placed near perspectives that have influenced them. Many entries could easily fill this part of the diagram; only a small subset of subjects are represented here. The inner circle of the diagram represents the material or objects of inquiry of molecular evolution: DNA, RNA, and proteins. While this may seem to include most biologically important molecules, it does not include all biologically important molecules. This diagram provides an overview of the many issues under investigation in molecular evolution. It also posits molecular evolution as a discipline at the nexus of several others. While the transdisciplinary nature of molecular evolution is captured in the any-side-up diagram, the history of this field is not. A historical overview of the study of molecular evolution is presented in the General Timeline avaliable here. This page was written by Michael Dietrich. It was last updated on May 15, 2004.